The house gets dark at 4:30 in the afternoon these days. Cozy sweaters have replaced the thin ones of fall. Storm windows have replaced the screens on the windows. Mittens are appearing in the entryway of the house. The time for comfort is here, winter is sitting on our doorstep. The husband and I, we're homebodies. Once the temperature drops, so does our motivation to leave the cozy confines of our little bungalow. Don't get us wrong, we love a good meal out at the local pub or a special meal out at a new place. Our travels often revolve around menus and restaurants. Truth be told, however, our favorite meals are ones shared on a weekend night, at home, together with the pugs, and a bottle of red wine. Saturday nights in the winter also means Hockey Night in Canada in our house. Yes, we live in New England, but the husband hails from near Toronto, Ontario and spent 10 years in Vancouver, British Columbia before moving here to Massachusetts to be with me. NHL Network here in the States carries the first game of Hockey Night in Canada (usually the Toronto Maple Leafs game, my husband's team). So on wintertime Saturday nights, I like to make a cozy meal here at home in my PJ's and settle in with some wine and enjoy a quiet night with the husband and dogs. This week's comfort fare satisfied a week-long craving for Cottage Pie. Some of you may look at this and say, "isn't that really Shepherd's Pie?". Actually, when made with ground beef (which I still prefer to ground lamb), it's really Cottage Pie. The best part about a meat pie? You can basically put whatever leftover vegetables you have in it. I used up carrots, peas, green beans and potatoes in this dish. Greens or root vegetables could be added as well. 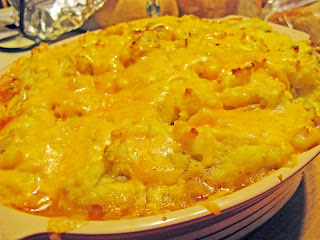 Although I used my leftover turnips in another Turnip Gratin since the husband likes them so much. 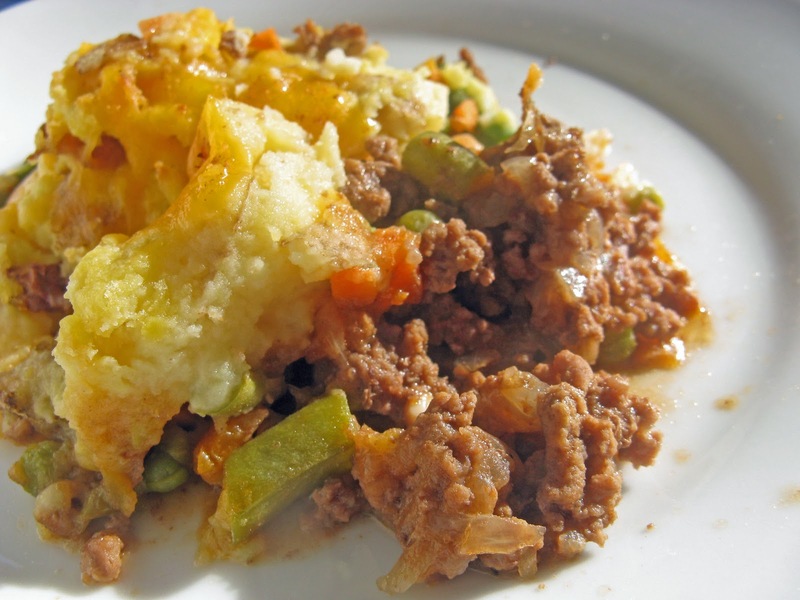 Cottage pie recipes are easy to find out there, but the challenge is finding one that really produces flavorful meat. Too many of them are bland - this one is not one of those recipes. Preheat oven to 400 degrees. Place potatoes in a large pot, cover with cold water and cook until fork-tender over medium-high heat, about 30 minutes. While potatoes are cooking, heat 1 teaspoon of olive oil in a large skillet, add ground beef and brown. Drain off any excess fat and add onion and garlic to the skillet, cooking for 2-3 minutes. Now you can add the dry mustard and the Worcestershire Sauce and stir to coat all the beef. Push the ground beef mixture to one side of skillet, melt 2 tablespoons butter and add flour, whisking together to create a little roux. Whisk beef broth into roux area of the pan, once combined, stir into beef mixture. Allow everything to come to a simmer and reduce down a bit, about 7-10 minutes. Once reduced, add tomato paste and stir to combine, keep warm over low heat. Meanwhile, take the cooked potatoes, drain, and if not skinned, pass through a ricer back into the now-empty pot they cooked in. Take the 4 tablespoons of butter, melt it, and then add to potatoes along with half and half and salt to taste. Take a baking dish (9-inch deep pie, or casserole dish) and pour beef mixture in, and spread with a spatula to cover the bottom. Now, add all of your fresh vegetables as the second layer and finally spreading the mashed potatoes over the top as the last layer. Place into oven on top of a baking sheet to catch any spillover. Bake for 25 minutes until top of mashed potatoes are golden. Sprinkle cheddar over the top and bake for an extra 5-7 minutes until cheese is melted. Take out of oven and allow it to sit for 5 minutes before serving. Ooooo! I've been looking for a good cottage/shepherd's pie recipe! I can't wait to try this one! Thanks for sharing it! I know what you mean! I actually kind of want to go out tonight, but it is dark and cold. . . so more homemade soup is on tap! My husband would love this cottage pie recipe!